The Jaguar XF Sportbrake range is about to be crowned by a seriously fast performance version, which will be unveiled in public at the Geneva motor show in March. 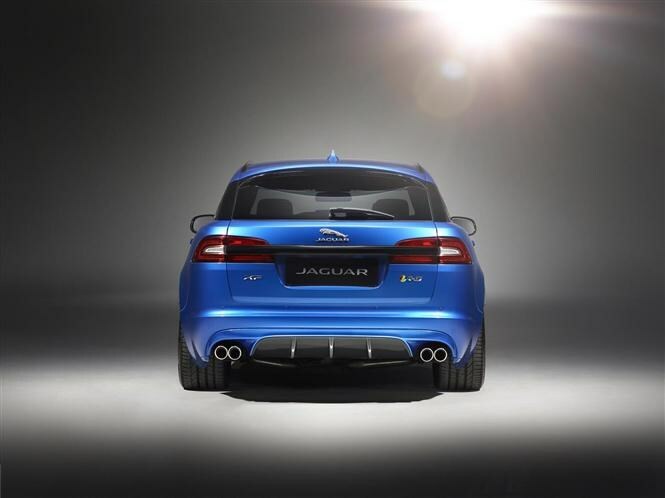 Called the Jaguar XFR-S Sportbrake, it’s capable of sprinting from 0-62mph in 4.8 seconds and has an electronically limited top speed of 186mph. Like the Jaguar XFR-S saloon (which we’ve reviewed here), it’s powered by a 5.0-litre supercharged V8 petrol engine with 543bhp and an enormous 680Nm of torque. It drives the rear wheels via an eight-speed automatic transmission and if the saloon is anything to go by it’ll sound pretty wonderful too. There’s still the same 1,675 litres of load volume (when the rear seats are folded flat) as the regular Sportbrake, so you’ll be able to transport the kids, the dog and flat-pack furniture at incredibly high speed. The rear seats, released via levers in the boot, are split 60:40 and include a load-through ski hatch. Aside from squeezing an enormous engine under the bonnet, Jaguar’s engineers have also been tinkering with the Sportbrake’s suspension and, as in the XFR-S saloon, there’s a clever electronic differential to help transmit all that power to the tarmac. Ultra-wide tyres are fitted, specially developed by Pirelli. 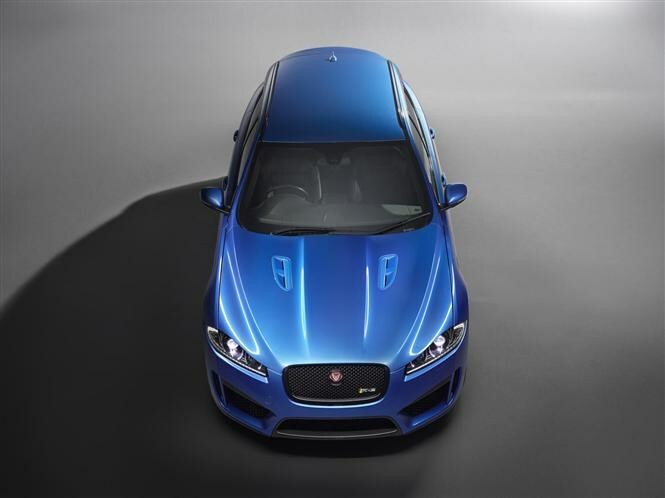 The XFR-S looks rather more aggressive than the regular Sportbrake with 20-inch wheels, outsized air intakes in the splitter-shod front bumper, a spoiler on the rear tailgate and an extended rear bumper with a carbon fibre diffuser section. 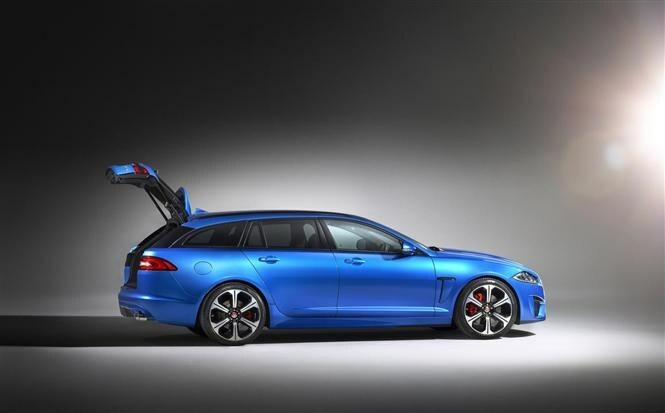 Jaguar says the bulked-up bodywork isn’t just for show as it generates less aerodynamic lift at speed than the regular Sportbrake. There’s a choice of five exterior colours – blue, black, grey, white or red. Inside the seats are trimmed in charcoal-coloured leather and the dashboard fascia is finished in dark aluminium. Standard equipment includes a high-end 825W Meridian sound system which should sound rather special. 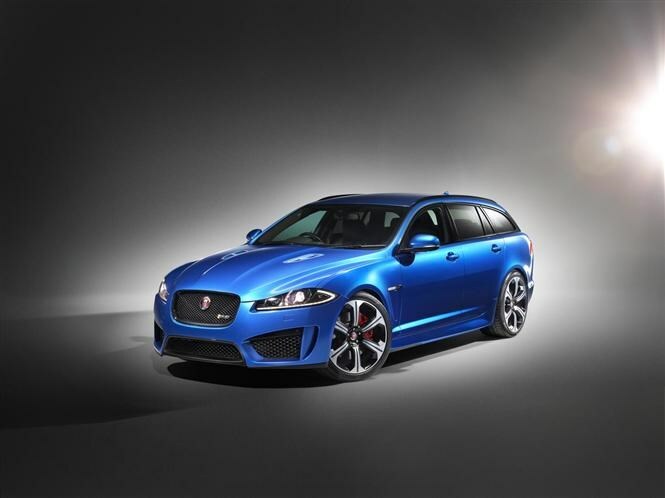 As the first high-performance estate car Jaguar has produced, the XFR-S Sportbrake’s natural competitors include the Mercedes E 63 AMG estate and Audi RS6 Avant. Unfortunately, like the Audi and Mercedes it carries a serious price tag to match its serious performance – the XFR-S Sportbrake goes on sale in the UK in April with prices starting at £82,495.